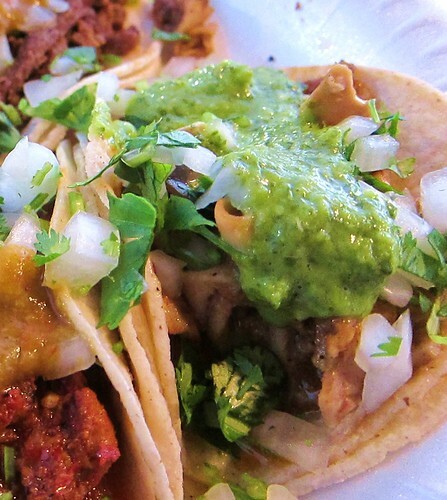 About a block North from El Comal De Mexico is Taco Dollar where tacos are, you guessed it, $1 dollar each. I figured I would stick it out in this shady neighborhood for the opportunity to cross another taco truck off the to do list. 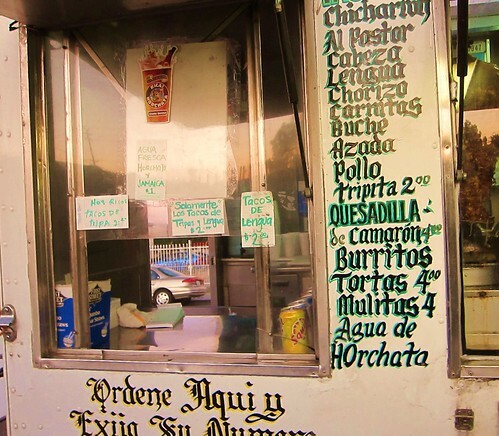 I had been curious about Taco Dollar since this post on LA Taco a few years back. I’m not sure you can find a more poorly designed city than the city of Lennox. This could not be more evident than on Inglewood Ave where you have homes next to business’s next to oddly constructed mini malls that are a good 50 yards from the street with long driveways that pour into poor designed parking lots. Taco Dollar parks in front of one of these odd mini-mall creations. It’s a pretty tidy operation at Taco Dollar. When you pay you get a ticket and when your order is ready your ticket is announced over the loud speaker. This is where all that counting to 100 in Spanish class really pays off because your number will not be read in English. I’m sure eventually it would be read off on English but do you really want to embarrass yourself by not knowing that veintidos means 22? Once your number is called you are handed your plate of tacos and you take them to the salsa and condiment containers to garnish them. There are three salsas to choose from ; a verde, a habanero roja, and a avocado and jalapeno pepper salsa. There are no cups for salsa on the counter so some expertise in ladling the right amount of salsa on each taco comes in handy. You also have to garnish your tacos with onions and cilantro. A tub of pickles sits next the salsa containers if you’re daring enough. 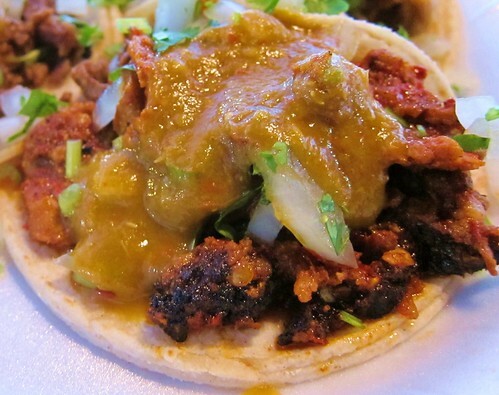 I ordered carne asada, al pastor and buche(pork stomach). For the asada and al pastor I went with the habanero, for the buche the avocado salsa. The buche could have been a little crispier but that’s just my personal preference. I like buche that is a little crunchy. The avocado salsa was excellent however and was partly the reason I had no problem wolfing down the buche. The al pastor was cut from the spit but it was cut in dense chunks some of which were too fatty and some of which were burnt. I had a hard time getting through it to be honest. The bits of pork that were not fatty or burnt were very good but overall I got a dud. The asada was cut in long thin strips and was tender and was much tastier than it looked. 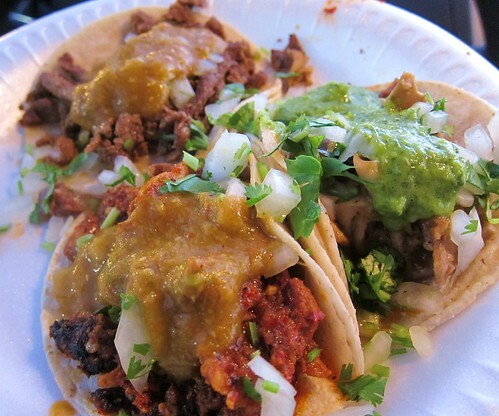 In both tacos the habanero chile was the dominating flavor. The habanero was excellent. Both salsas were excellent actually, but the habanero was both fiery and really flavorful. It made me sweat a little and for a brief moment my face turned red. The 22 oz bottle of water I had didn’t do a lot to help but eventually I adjusted to the heat. I got back in my car and drove south on Inglewood Ave and turned left on to Lennox Blvd and took Lennox Blvd to Hawthorne Blvd. 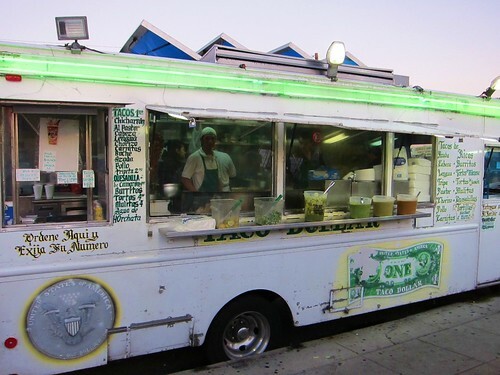 I passed another taco truck selling birria de chivo, then another called Tacos El Vaquero, then another called Tacos El Gordo. I could have stopped but I was six tacos in and another three tacos would have been pushing it. I pulled out my little black book and scribbled in the locations of these trucks. Lennox, you may be one dodgy town but you haven’t seen the last of this taco reporter.